Traveling in Peru on a budget requires some discipline and smart money management, especially for longer stays. The following tips will help you stretch your Peru budget as far as possible, giving you extra cash for occasional splurges and expensive tours. If you don’t know how much the Peruvian Nuevo Sol is worth, you’ll have a tough time knowing how much cash you’re actually spending. Get to know the local currency and, just as importantly, stop comparing Peruvian prices with prices back home. There are certainly bargains to be had in Peru, but avoid excessive spending sprees based on a “that’s so cheap” mentality. It all adds up. Touristy restaurants, especially in hotspots such as Lima, Cusco and Arequipa, are vastly more expensive than the typical restaurants frequented by regular Peruvians. Eat where the locals go and you’ll be surprised at how well you can eat in Peru on a budget. Shoestring travelers should make the most of lunch in Peru, when big meals are available at incredibly low prices. Scams and trickery are the scourge of a traveler's budget. Whenever money is involved, be wary. Being shortchanged by a wily shopkeeper is annoying, but being conned out of two perfectly good 50 sol notes in exchange for a fake 100 is sure to ruin your day. It’s a good idea to learn about the types of scams in Peru and how to avoid them. Whenever possible, agree on a price before accepting a service. If you don’t, you might be presented with an unexpectedly large bill. Peruvian taxis are a prime example. With no meters, it’s up to you to negotiate a price before each cab ride. If you think the fare is too high, find another taxi -- much easier than arguing over an inflated price at the end of your trip. As a budget traveler, you’ll probably stay in a few hostels. If the idea of cooking your own food doesn’t send shivers down your spine, try to find hostels with communal kitchens. Buy some basic supplies in the local market or supermarket and cook up a feast in the comfort of your own hostel. If you split the cost with other travelers and cook together, you’ll save a significant amount on your daily eating expenses. Peru isn’t a big tipping nation, so don’t go blowing your daily budget on unnecessary tips. There are a few occasions when a tip is expected, such as in midrange to upscale restaurants, but don’t feel the need to hand over your loose change to taxi drivers. Peruvian taxi drivers don't expect tips, and they are probably overcharging you anyway. Don’t spend all your nights in bars and discos. Alcohol is a financial black hole for budget travelers, and you might have a worryingly light wallet after a night on the town. When you do go out drinking (you’re on holiday, after all), avoid tourist traps, super-trendy hotspots, and expensive shots. Beer is generally the cheapest option in Peru. Don’t be afraid to haggle over prices, especially in traditional markets. Prices generally start high, so it’s your job to settle on a price acceptable to both parties. Also, try negotiating prices for hotel and hostel rooms. You’ll often receive a straightforward no, but there’s no harm in trying. It’s easier to get a discount for stays of at least four to five days. If your hotel or hostel has a free breakfast, drag your bones out of bed and make the most of it before it’s gone. Breakfasts normally start at about 7 a.m. and finish at 9 or 10 a.m., but the later you are, the slimmer the pickings become. Free accommodation is nothing to be sniffed at, and that’s exactly what the CouchSurfing organization provides. 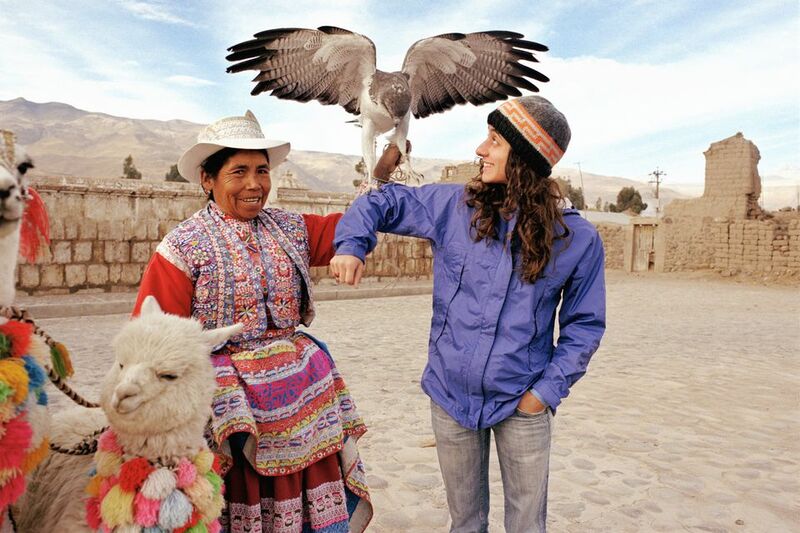 With more than 4,000 CouchSurfing members in Peru, your chances of finding free accommodation are good. Many of the members are located in Lima, but you’ll also find them in places such as Ica, Trujillo, and Huaraz. If you don’t speak any Spanish, your ability to negotiate prices, haggle and avoid scams will be severely limited. Complete Spanish lessons and audio courses are expensive, but your language skills will save you money on the road. Don’t always assume that a tour is necessary. Many historic sites and natural attractions in Peru are easy to reach by public transport, normally a much cheaper option than private tours. In many cases, you can hop on a dirt-cheap minibus and find a local guide when you arrive at your destination. Find out which ATMs charge the lowest withdrawal fees abroad. Ask your bank for information before you leave home. You may find that your bank is part of the Global ATM Alliance, in which case you might be able to avoid some withdrawal fees. Scotiabank, for example, is part of the alliance and has more than 270 ATMs in Peru. If you want to buy souvenirs, buy at the source or in local markets rather than in touristy shops or airports. The center of Cusco and the Miraflores district of Lima are good examples, with fancy stores selling overpriced items to tourists. Take a short taxi ride to a traditional market and you’ll probably find the same items for almost half the price. A bunk bed in a hostel dorm should be a cheap option, but that’s not always the case. Peruvian hostels target international backpackers rather than Peruvian students, with prices often reflecting this target audience. You’ll never pay too much for a hostel but bear in mind that Peru has some very affordable hotels. If you are traveling with your partner, a secure hotel room with a double bed, cable TV, and private bathroom often works out at the same price as two beds in a 12-person dorm. One irritating aspect of traveling in Peru is the commonly held belief that all foreign tourists are rolling in money. The offshoot of this mentality is the appearance of “hangers-on,” locals who are eager to invite you to a bar or club for a drinking session, only to leave you with the small matter of paying for everything. Many Peruvians are happy to chip in and pay their share, but keep an eye on the situation unless you are willing to pay for a large bar bill. There are inexpensive internet cafes everywhere in Peru, so there’s little point making expensive telephone calls to friends and family back home. Most public computers have Windows Live Messenger (MSN Messenger) installed. Skype is harder to find unless you are in a big city like Lima or Cusco. If your parents aren’t computer savvy, try to give them a brief Messenger or Skype tutorial before you leave. Opportunistic theft is rife in Peru. If you leave your camera on a restaurant table, don’t be surprised if it vanishes. The same applies to all valuables in a variety of situations, so keep your gear close and don’t be careless. Having to buy a new camera will ruin your weekly budget. Flights aren't too expensive in Peru, but hopping from one city to the next will soon put a dent in your budget. If time allows, use long-distance buses to get from A to B. Not only will you see more of Peru, you'll also arrive at your destination with extra cash to spend on tours and entertainment. There is, however, one important thing to remember: stick with the midrange and top-end Peruvian bus companies. The cheapest buses are not safe and should be avoided.